← Join RU’s Team for the Bike Commuter Challenge! Some fascinating regional sustainability news from one of the SUST Program’s great partners, the Field Museum: the Chicago Region conservation team in the Museum’s Keller Science Action Center drew on the Quality of Life planning process used in South America by their Andes-Amazon counterparts to bring together disparate and sometimes contentious stakeholders around conservation land use in the globally rare black-oak savannas of the Kankakee Sands. A team of Action Center scientists has been working since March on a process that will ensure that the community’s voice will be reflected in local conservation land use decisions. After sustained negotiations, representatives from the Museum, the Economic Alliance of Kankakee County, Kankakee County Regional Planning Commission, Kankakee Country Farm Bureau, Pembroke Township, Pembroke Consolidated School District #259, The Nature Conservancy, U.S. Fish and Wildlife Service, and the Village of Hopkins Park signed a resolution to work together to develop a “Sustainability Plan” for Hopkins Park and Pembroke Township. The resolution was announced at a press conference on May 19, 2016. The plan “provides the ways and means to preserve and sustain the community history, culture, and natural environments in addition to land preservation for current residents and future generations.” The stakes heightened when the U.S. 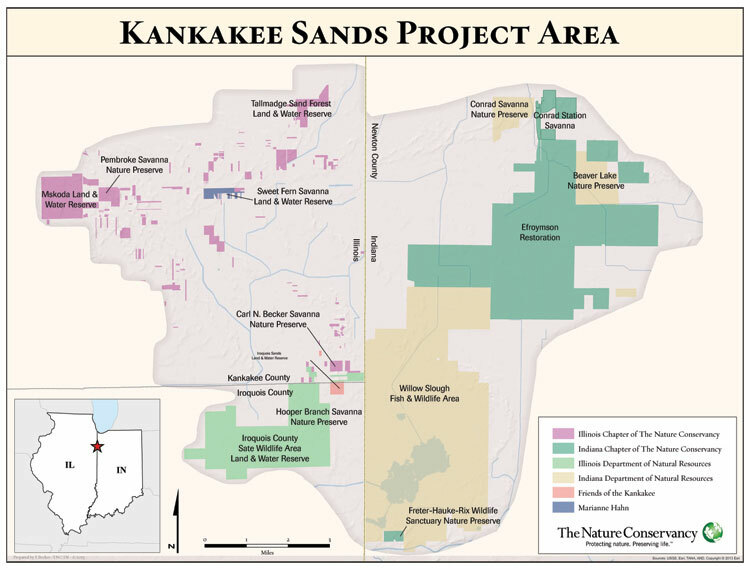 Fish and Wildlife Service announced plans for a Kankakee National Wildlife Refuge and Conservation Area, which the service intends to be a local community asset and a conservation area of national importance: USFWS announced that it will not purchase land in Pembroke Township until the Quality of Life plan is completed. This entry was posted in community, conservation, Illinois, museums, news, planning. Bookmark the permalink.